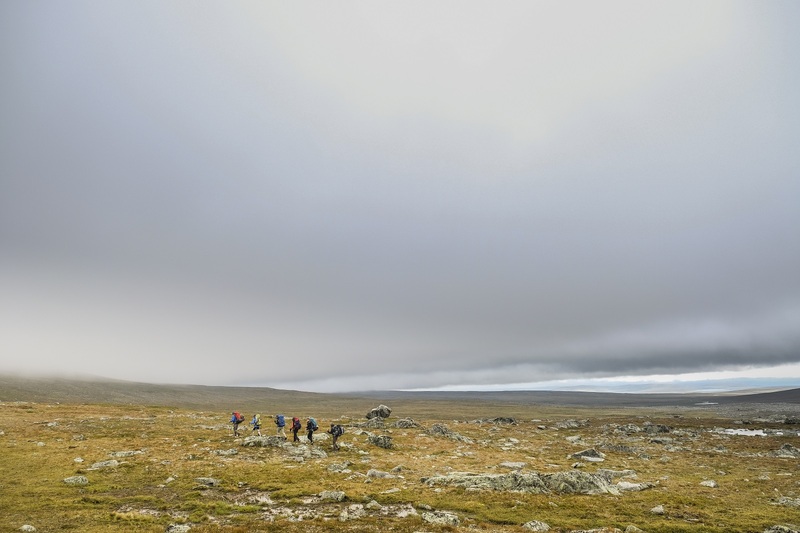 A group of seven adventurers from five nations hiked Finland’s classic Calotte Route up to Halti, the country’s highest peak. 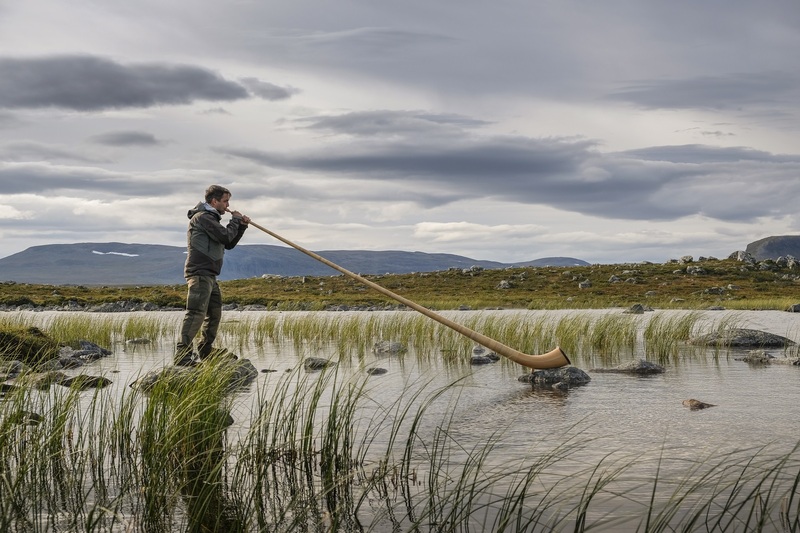 They each carried a section of a seven-piece alphorn in their backpacks and sent a musical anniversary greeting over the hills of Finnish Lapland from the top. The celebration was part of an eight-day trip celebrating the nation’s centennial. The idea to hike the historic North Calotte Trail was hovering with me since I started to listen more carefully to the stories of Scandinavians outdoor professionals. They marveled about the rich and phenomenal landscape in this almost untouched environment. The highest mountain in the area is called Halti. The very top of the mountain is on Norwegian side and just a few meters away you set over the invisible border to Finland and touch the yellow-grey stone monument on the east top, which is the highest spot of Finland. This place has gained global attention this year, when a Norwegian movement started the discussion on giving a tiny piece of land to Finland on their 100-year anniversary, so that the real mountaintop could move over to the Finnish side and they had a real top summit. Finland’s 100 years of independence has been celebrated within the country and all over Scandinavia in numerous events. When I contacted several of my journalist friends in various countries, all of them were stoked to follow and to start planning a thorough Finland trip this autumn. Hailing from Germany, Austria, Iceland, the U.S. and me from Sweden, our group first gathered in Helsinki for the nature day celebrations on August 27 and to explore the country’s capital city. 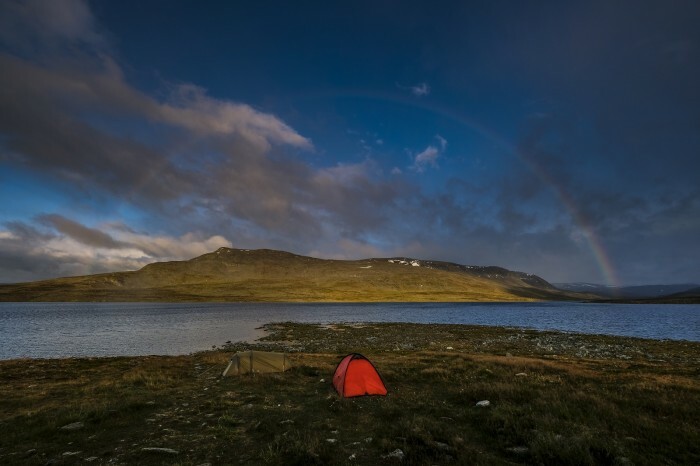 After a moving stop-over in Rovaniemi—including an e-Bike tour and a private audience with Santa Claus, our team arrived in Kilpisjärvi late Sunday evening to prepare for a five-day trek into the wilderness. We unpacked all our travel bags and supply boxes in the middle of the cabin. At the tourist office we had picked up a delivery with almost 40 kilos of travel food and our “baby”, the 3,5 meter long Swiss alphorn. We split and shared all of the group supply and packed the individual packs to land between 23 and 28 kilos per person. After an early wake up and even before breakfast, we worked on our shell garments and equipment with impregnating jackets, shoes and also the dry-bags, which covered the alphorn. We signed off at the tourist bureau and decided to stay in hikers’ huts and bring our tents just for safety reasons. The start of the walk in a new team constellation is always exciting, since it takes time to define speed, food breaks, routines and ambition. For two days we followed this magical path through wild forests alongside deep lakes and into massive landscapes of all colors and shapes. Our team worked more than well and with peace and seclusion from outside contact, we were busy talking and singing and fishing and cooking together. A bit worn out after a rainy afternoon, we arrived happily at Pihtsusjärvi, a larger camp area before our final summit hike. Our group arrived at the summit at lunchtime on Wednesday August 30 after two-and-a-half days and 53 km of hiking through the national park. We spent more than an hour on the windy peak, celebrating by toasting with sparkling wine, giving hugs to all the hikers on the summit and assembling the alphorn to blow greetings down into the fells in a gesture of respect for the 100-year anniversary of Finland’s independence. The summit time we also spent with other important things. Being without phone connection for several days and receiving access to a Norwegian telecom network, most of us called home to the families and reported our status and wellbeing. We chatted, posted greetings and even answered emails until our fingers froze stiff. Every one of us later recalled this situation as absurd and fun. Our fantastic summit experience together, our individual fuddle with personal matters through our smart phones and our sudden understanding that we have to dive back into the group modus again fast – to keep control of our frozen bodies and ensure a safe descent into the valley. We climbed down some 30 minutes through the upper field of wet rocks, to then hide from the wind behind a huge boulder and warm up our bodies with a hot soup and coffee. We arrived back to our bunk beds exhausted but happy and sank into an early sleep. 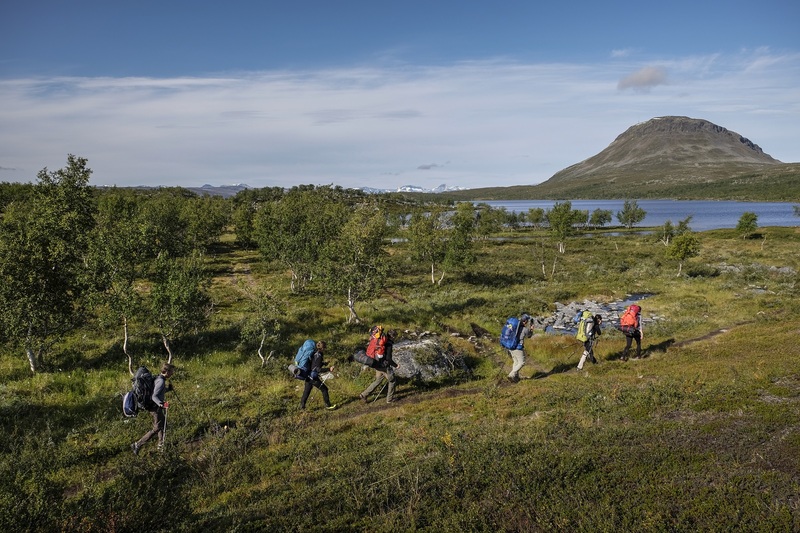 The return trip along the same trail towards Kilpisjärvi offered sunny days, cozy evenings with cooking and exchanging experiences and moments from the hike. Kilpisjärvi gave a smooth welcome to the team, with comforting saunas, live music and friendly hospitality. The team split up again in Helsinki, departing in different directions and bringing along lasting memories and plans for our next travels up to the top of the remaining Scandinavian countries to complete the Scandinavian Summits project. The trip has been a wonderful week for all of us and we met with the most polite and friendly people alongside the trail. The experiences we had together have been above our expectations. This has also been a successful pilot trip to the goal we set ourselves: to travel all Scandinavian countries and hike their highest points on the classic routes, experience the beauty of the various landscapes and absorb the magic of the particular scenery. www.visitfinland.com, www.visitrovaniemi.fi, National parks: https://www.metsa.fi/web/en, Kilpisjärvi Visitor Centre: kilpisjarvi@metsa.fi. We recommend: www.rolloutdoors.com, www.tunturimajat.com, www.santashotels.com, www.laplandhotels.com, https://santaclausoffice.com/en/, www.suomifinland100.fi. 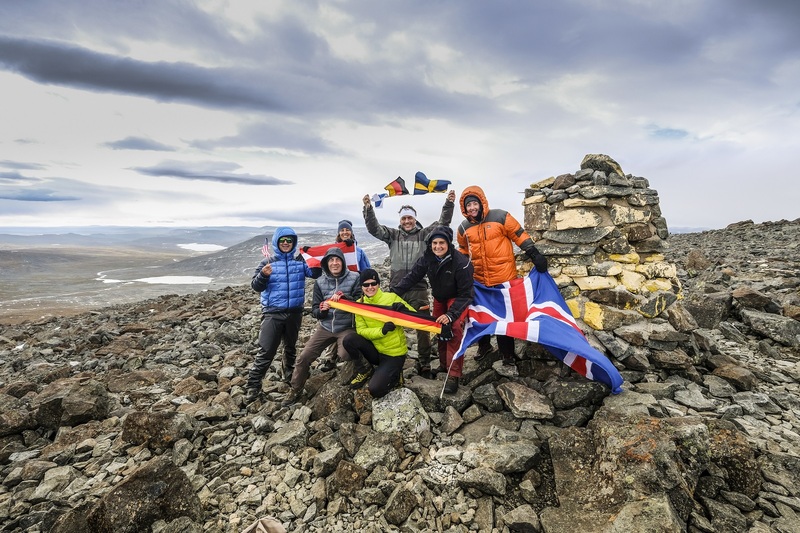 The general idea of the Scandinavian Summits project is to inspire and stimulate people of all ages and groups to reach the five highest peaks in every of the Nordic countries, which are Denmark, Norway, Sweden, Finland and Iceland. Accomplishing each of the mountaintops will be registered and rewarded with a certificate when completing the “Nordic High Five” (alternatively: the “Scandinavian Crown”, which is earned with collecting the highest tops in DK, SE and NO). www.scandinaviansummits.com, facebook & instagram. Haglöfs, Nikwax, Sidas, Calazo, Deuter, Lowa, Viking, Suunto, Fjällräven, Lundhags, Helsport, F-stop, Trek’n Eat, Swix. Alphorn by www.alphorn-center.de.